Our new for 2016 HD3 dolly has an adjustable folding rear caster assembly with several patents pending. This is the strongest dolly available with rear casters and is super fast to use. 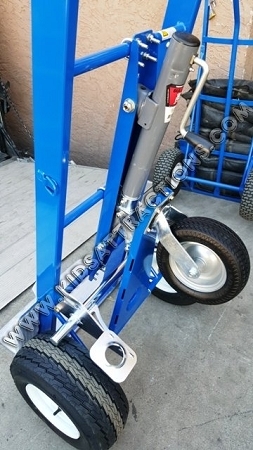 This dolly uses a Bulldog side wind jack to adjust the angle of the rear caster so you have the best angle for any size load and the best part is it retracts for transportation and storage. This dolly took several years of development and testing and we are very happy with the results. Nothing on the market even comes close to this dolly in design or function for heavy off-road use so order one today. 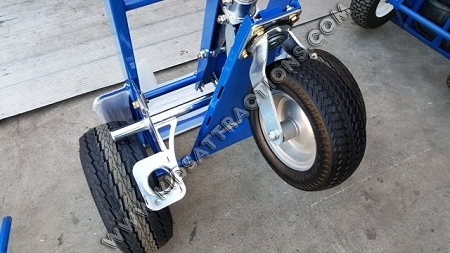 This dolly has an optional brake assembly available for only $85.00 so be sure to add it to your order and it will come preinstalled ready to use. 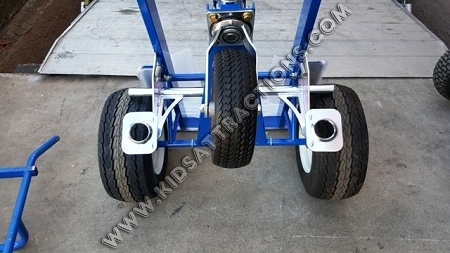 Don't be fooled by dollies with fixed rear casters because they may be fine on flat level ground but what about going up or down a trailer ramp or with items that balance at different from being tall or short. It makes a huge difference. Our adjustable caster assembly can be adjusted with or without the load attached. We love this! It doesn't take up much more space than a standard hand truck, yet it does so much more! This thing actually makes it fun to move large inflatables and accessories on any surface. The other night I had 8 sandbags and 5 blowers piled on it and I easily hauled them 200 yards. That's something that used to be multiple, exhausting trips. It seems like it will be very durable as well. My guys destroy everything, but I suspect this one will last. Since everybody will want this in their truck, I will probably order at least one more in the near future. Well worth the money. Q: Do you custom modify these? We have a need to carry 8' tall doors over rough terrain to jobsites, and so would want a taller dolly to accommodate this. Q: Can this dolly load/unload a 900lb waterslide from a trailer with ramp? A: It would be better to use the HD4 with trailer dolly for heavy loads going up and down trailer ramps. The HD3 works best on lift gates and areas without a big difference in angles. 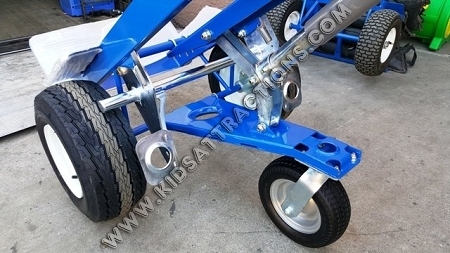 The trailer dolly can handle the hard impacts created going up and down ramps. The folding caster is not designed to take hard impacts its designed for balancing the load. Q: I'm a plumber will this work for hauling 10'joints of cast iron pipe and copper pipe through buildings and into elevators will it be able to lower enough to get said pipe in and out of elevators? A: I made a custom dolly for hauling heavy steel cabinets so it has a non angled lower plate perfect for heavy appliances, gun safes, crates, tool boxes and similar items but 10' tall steel pipe may be an issue. 6' pipe would be fine but would need to do some tests with 10' pipe.